Director Shankar is back with yet another mesmerizing film “I” (at least that’s what we expected). His latest project was released on Pongal worldwide with over 15,000 screens. This man has had a winning stroke with all his films and has managed to make grand films with a message. But this time, he fails in spite of the fact that he has the very talented Vikram by his side. The director has not lost his panache and neither does his choice of the main protagonist lets him down. It is the loose script that plays the villain. Vikram plays a body builder named Lingesan. He has only two passions, a body like Arnold Schwarzenegger and Diya (Amy Jackson), a super model he dreams about. He likes her to the extent that he buys every brand she endorses whether it is soap or a sanitary napkin. Diya, in turn is busy modeling and escaping the approaches of John (Upen Patel), who is interested in her. Lingesan is well aware of the financial and social differences between him and his dream-girl and therefore does not really act like a crazy Romeo stalking her (Thank God!). His life changes when Diya asks him to replace John for an ad and he becomes a star overnight. Is stardom and rejection of a particular endorsement buys him several enemies. In order to introduce a love triangle, Shankar introduces a gay make-up artist who falls in love with Lingesan, who is now called Lee. 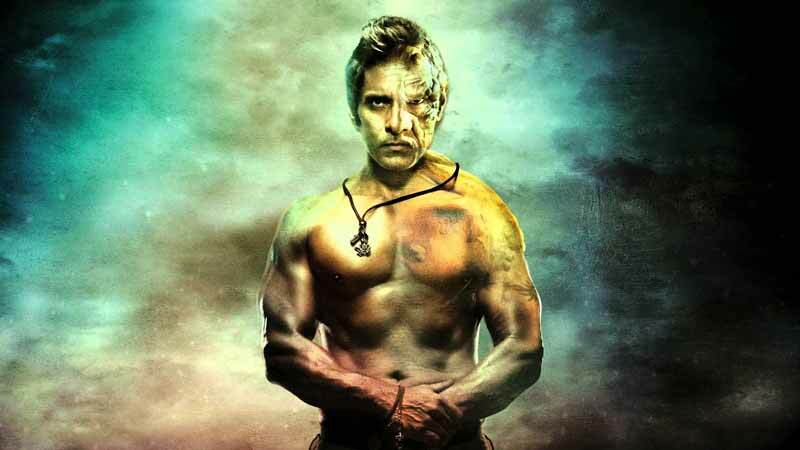 Vikram plays two roles in the film, one of a fit body builder and the other of a hunch back. It is very obvious that the actor has put in tremendous efforts to play both the characters convincingly. Unfortunately, that does not help the film very much. The plot of the film seems confusing and not crisp which is very unlike a Shankar film. Probably the unfortunate death of his co-writer has cost him too much and his absence reflects in the film’s script. Like all his previous films, ‘I’ is shot at exotic locations and on a grand scale with a budget of over 90cr. With such a grand budget, it is needless to say that the movie is shot grandly. Amy Jackson is not very impressive and needs to work harder. Upen Patel and the other supporting cast is simply forgetting and do nothing to add to the pace of the film. The movie is also very long and runs for over 3 hours. This makes it all the more tiring and unbearable to watch. The film is technically brilliant though and the locations are picture perfect. A. R Rehman’s music is soulful like always. Unfortunately, even the most beautiful locations and music do nothing to add to the chemistry between the actors. Our Verdict: Go watch it for the sheer technical brilliance and beauty and Vikram, only if you have the patience to sit through a film for 3 hours.